‘Let’s do Laundry’, said no one ever! But if your Laundry cupboards look a bit like this, you might feel a little bit more inclined to wash, dry & fold! 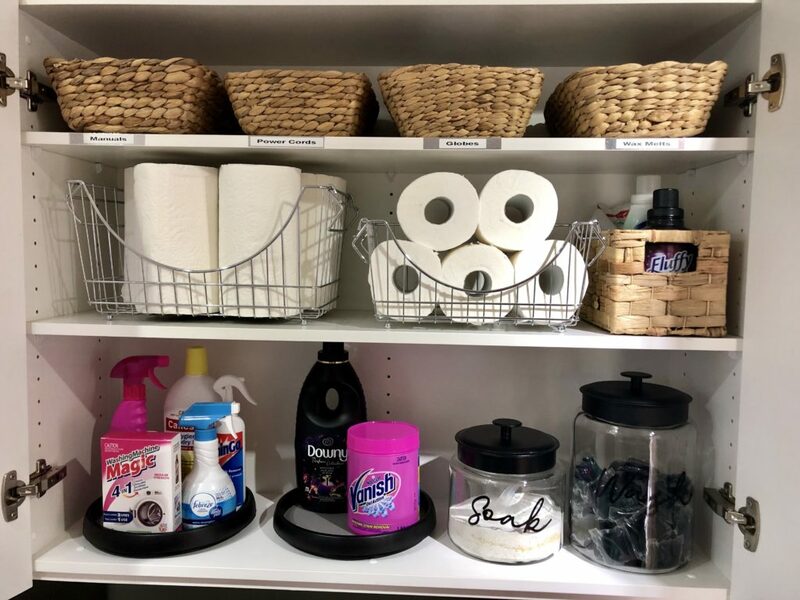 In Part 1 we looked at the Tall/Broom cupboard – This post will show how I’ve organized my overhead cupboards. This cupboard is the one directly above the washing machine and dryer. 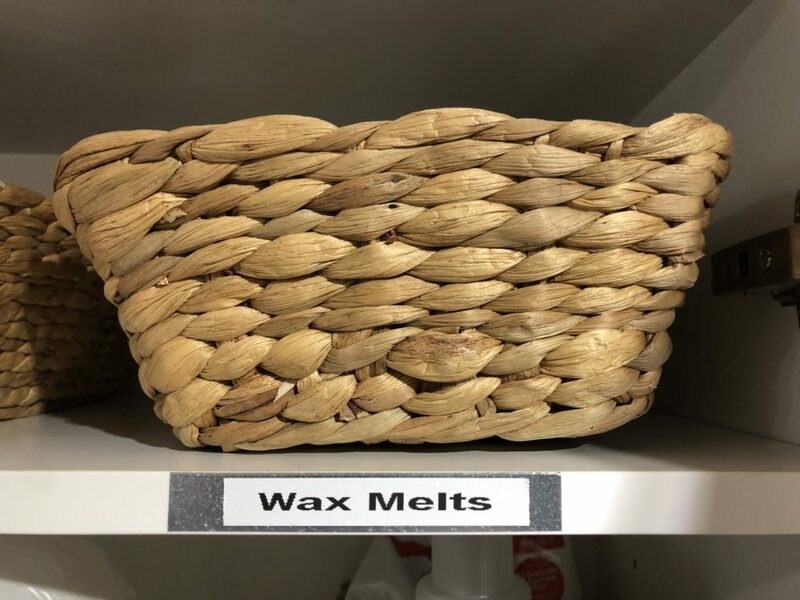 I’ve used 4 of the Small Rectangular Baskets – $3.50 each – on the top shelf to store electrical appliance manuals, power cords & adaptors, light globes and wax melts. 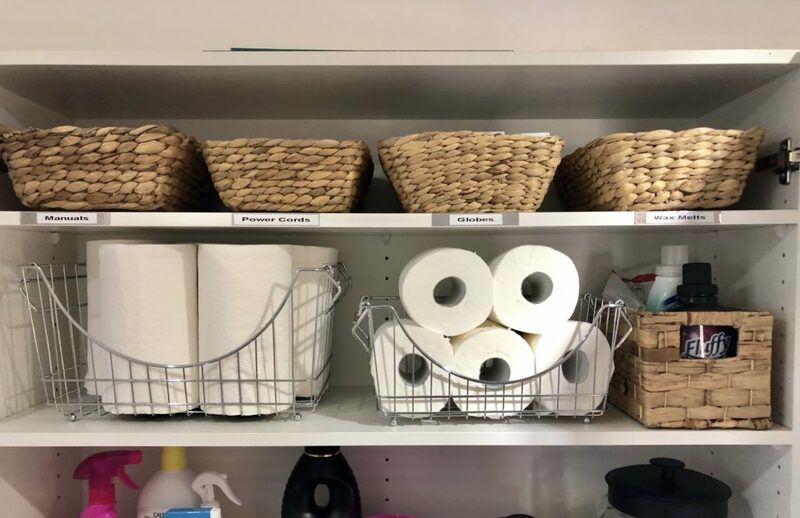 Under the baskets I’ve use the Large Chrome Stackable Basket – $9 – to store my paper towel and next to that the Small Stackable Basket – $6 – to hold some spare toilet rolls for the outside toilet. Next to that is one of the smaller rectangular baskets from the Set 3 Rectangle Baskets – $14 – to hold my fabric softener. On the lowest shelf, I’ve use the Storage Turntables – $5 each – from the Kitchen department, to hold my washing supplies. (And my Febreze!) These are brilliant – makes it so easy to see/find what you’re looking for! And to finish it off, I grabbed the new Glass Soak Jar – $6 and the new Glass Wash Jar – $8. I love this cupboard – it’s easy on the eye, and v v practical! 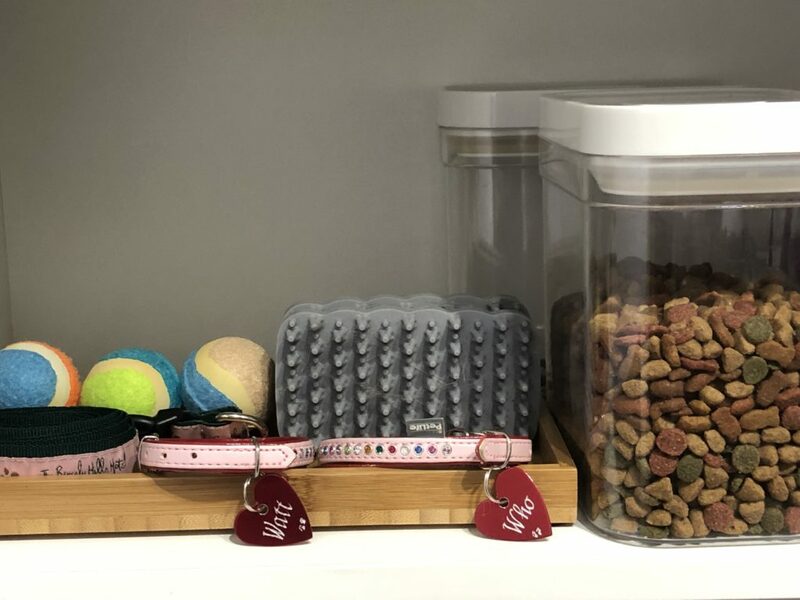 Next to that cupboard, I have a ‘Pet Cupboard’ – we don’t have any Kids left at home, but we do have a house full of fur! 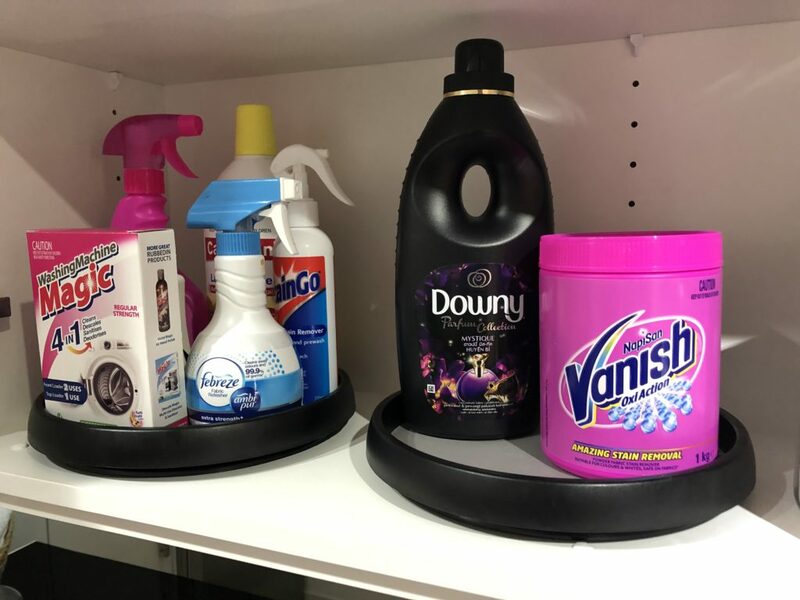 Keeping all their things together in this cupboard makes life so much easier! On the top shelf I’ve used an Acrylic Pen Cup – $7 – to hold their brushes and combs, and next to that, the Small Clear Drawer – $2 – to hold their Shampoos. On the bottom shelf I’ve got the Bamboo Tray – $7 holding their collars, leads, balls and rubber grooming brushes. 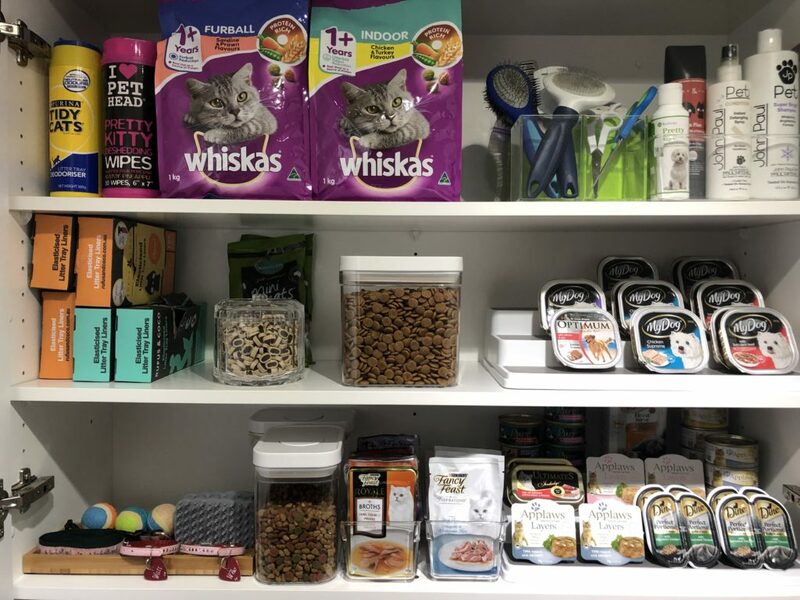 I also keep the Cats dry food in the Push Close containers and their tinned food on a three tiered shelf. So that’s my laundry cupboards sorted, organized and functional. Everything is on hand, easy to see, and easy to reach for … that’s what I call wonderful! 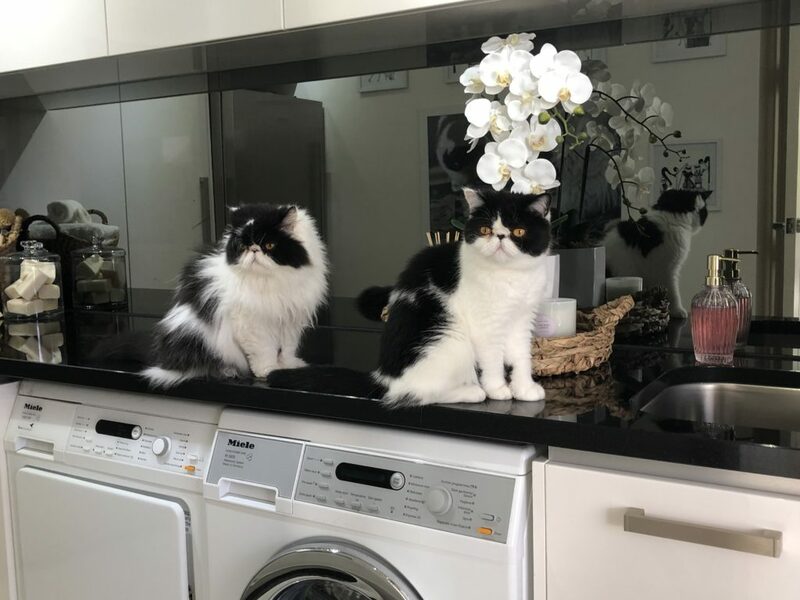 The less time spent in the Laundry, the better! If you’d like to see how I’ve styled the bench top, (without cats), you can read about it here. Don’t forget, if you get any inspo from this post, use the #kmartstyling hashtag in your social media pics so all our followers can see it as well!